This article by Robert Loerzel originally appeared in Punk Planet’s January-February 2007 issue. See Underground Bee for a longer version of this Q&A. 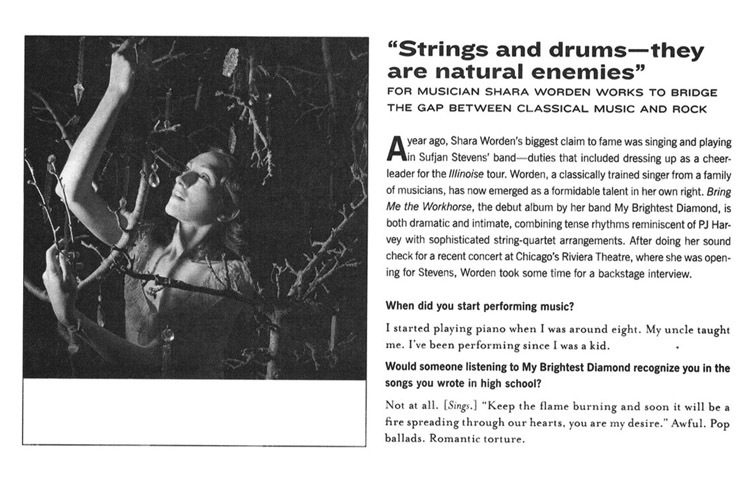 A year ago, Shara Worden’s biggest claim to fame was singing and playing in Sufjan Stevens’ band—duties that included dressing up as a cheerleader for the Illinoise tour. Worden, a classically trained singer from a family of musicians, has now emerged as a formidable talent in her own right. Bring Me the Workhorse, the debut album by her band My Brightest Diamond, is both dramatic and intimate, combining tense rhythms reminiscent of PJ Harvey with sophisticated string-quartet arrangements. 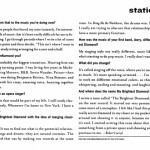 After doing her sound check for a recent concert at Chicago’s Riviera Theatre, where she was opening for Stevens, Worden took some time for a backstage interview. When did you start performing music? I started playing piano when I was around 8 or so. My uncle taught me piano. I’ve been performing since I was a kid. Growing up in the family that we had, there was always performance, whether it was a family gathering or community gathering or a church thing. Would someone listening to My Brightest Diamond recognize you in the songs you wrote in high school? Not at all. [Sings.] “Keep the flame burning and soon it will be a fire spreading through our hearts, you are my desire.” Awful. Pop ballads. Romantic torture. How did you go from that to the music you’re doing now? I wasn’t one of those people that found my voice instantly. I’m interested in so many kinds of music that it’s been really difficult for me to focus in on something. I go through periods where I write a lot of tunes and get to a certain point and then decide, “This isn’t where I want to be.” And then I go study string arranging for a year and a half. Jeff Buckley was probably the biggest transition. Hearing him was a really, really big turning point. I was living five years in Michigan, so I was hearing Motown, R&B, Stevie Wonder, Prince—then hearing Jeff, who was doing Benjamin Britten, Nina Simone and Leonard Cohen with his crazy, amazing voice, burning together all these elements. I had no concept of that before. Did you want to be an opera singer? I’ve always thought that would be part of my life. And I still study classical music, privately. Whenever I’m home in New York, I have a lesson every week. 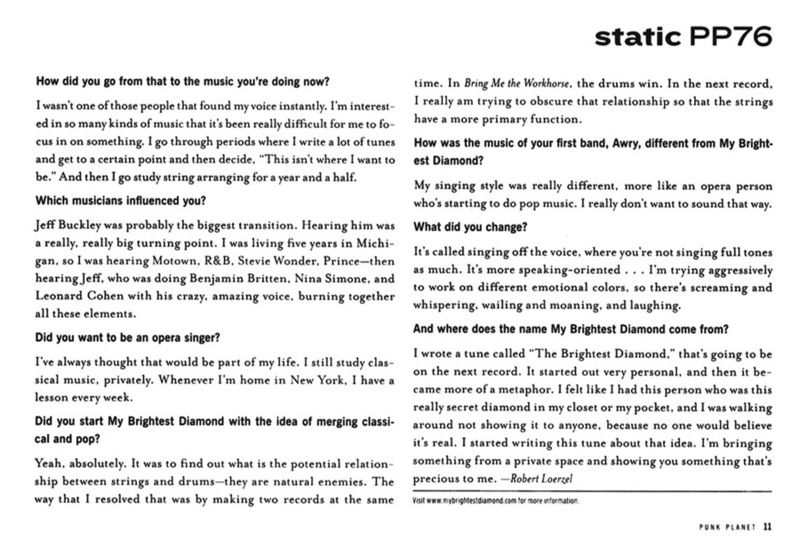 Did you start My Brightest Diamond with the idea of merging classical and pop? Yeah, absolutely. 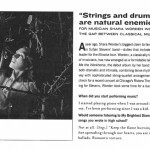 It was to find out what is the potential relationship between strings and drums, because they are natural enemies. The way that I resolved that was by making two records at the same time. In “Bring Me the Workhorse,” the drums win, and … the guitar still remains the fundamental piece. In the next record, I really am trying to obscure that relationship so that the strings have a more primary function. How was the music of your first band, Awry, different from My Brightest Diamond? My singing style was really different. The whole tone is there all the time. It sounds more like an opera person who’s starting to do pop music. I really don’t want to sound that way. It’s called singing off the voice, where you’re not singing full tones as much. It’s more speaking-oriented … I’m trying really aggressively to work on different emotional colors, so there’s screaming and whispering, wailing and moaning, and laughing. You have a lot of lyrics about bugs and animals in peril. Are those true stories? Actually, they are. I don’t want to get too graphic about what they’re about. I really like the idea of people being able to interpret them for themselves. And where does the name My Brightest Diamond come from? I wrote a tune called “The Brightest Diamond,” that’s going to be on the next record. It started out very personal, and then it became more of a metaphor. I felt like I had this person who was this really secret diamond in my closet or my pocket, and I was walking around not showing it to anyone, because no one would believe it’s real. I started writing this tune about that idea. I’m bringing something from a private space and showing you something that’s precious to me.